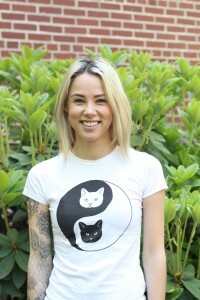 Shelby is a first year graduate student in the Department of Linguistics at the University of Oregon in Fall 2018. She received her B.A. in Linguistics from the University of Oregon in Spring 2016. Shelby has been working for Tyler Kendall as a research assistant since February 2015, transcribing sociolinguistic interviews for CORAAL, the first public corpus of African American English, as well as syntactic annotation of CORAAL with Beatrice Santorini. Shelby’s departmental senior thesis, Twentieth Century Sound Change in Washington DC African American English, is an acoustic vowel analysis using speakers from CORAAL. Shelby’s interests include language variation and change, specifically language and gender, style, and dialectology.